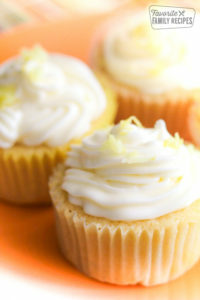 These Lemon Buttermilk Cupcakes with Lemon Cream Frosting taste like cupcakes you would buy at an expensive cupcake shop. Creamy lemon flavor in every bite! Preheat oven to 375 degrees. Place about 30 paper cupcake liners into cupcake tins. Sift together dry ingredients (flour, baking powder, soda, and salt). In separate bowl, mix together sugar and butter until fluffy. Add eggs one at a time, beating each egg until incorporated before adding the next. Add vanilla, lemon juice, and lemon zest. Add dry ingredients, alternating with buttermilk, (about 1/3 at a time) until all combined. Bake at 375 degrees for about 17 minutes or until toothpick comes out clean. I like to freeze cupcakes overnight before frosting. Don't know why, but they taste even better when I do! Regular cream cheese frosting is also really yummy on these cupcakes!